The demolition of the old Pennsylvania Station in October 1963 is considered a city tragedy, a “monumental act of vandalism,” as The New York Times put it at the time. It was also a catalyst for the preservation movement that’s saved countless buildings from also ending up in pieces in a Meadowlands dump. Photos of the 1910 Beaux-Arts masterpiece are in no short supply. But have you ever really looked at them and contrasted the images with the Penn Station of today? 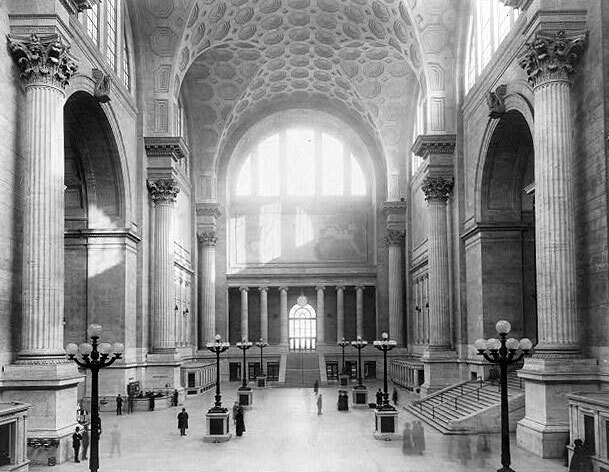 Here’s the original Penn Station main waiting room, above in 1911, inspired by glorious ancient Roman baths. Imagine waiting for your train there, next to one of six Doric columns under a 150-foot high ceiling, with sunlight pouring through the lunette windows. Here’s the Penn Station waiting room today, above right. Hmmm. Then there’s the main concourse, where passengers would go to buy tickets before descending the stairs to their trains. The original was made of glass and steel, reminiscent of train sheds in Europe. This is it above, in 1962, a year before it was torn down. Here’s the concourse now, an ugly blur of fluorescent lights. This entry was posted on May 17, 2012 at 4:11 am and is filed under Midtown, Transit. You can follow any responses to this entry through the RSS 2.0 feed. You can leave a response, or trackback from your own site. I’ve seen these photos many times, but I still find it sad that such an architectural gem was torn down – and replaced with a completely unworthy structure. I’ve seen the photos many times as well, and then for the first time I really looked at them and thought wow, what incredible beauty and use of light and materials. What a masterpiece. Who was the glorious mayor at that time? A pathetic political fool to say the least. But if it had remained standing by the 70s & 80s the city would have given up control of it, letting it be taken over by hoards and hoards of the homeless camping out where ever they would have found room, with little being done for them. It would have made Port Authority Building look like paradise on earth instead of a crime ridden enclave which it really was. 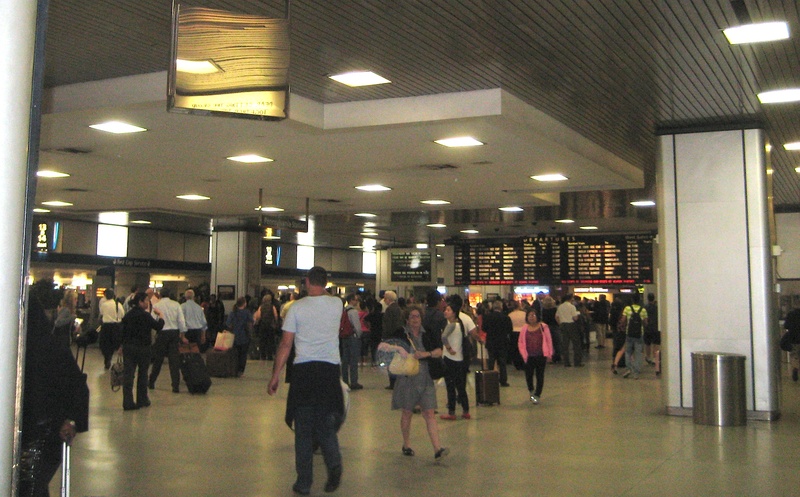 And as beautiful as Penn Station was in its last days can you imagine what it would have looked like by the 1980s? Maybe it was done for the best, who knows? Sincerely doubt that….After the pathetic politicans who agreed to demolish it, they realized the grave mistake that was made. I’m quite sure if they had it to do all over again it would still be standing. Crime ridden? No way. Not with today’s policing. Look at how New York City has become one of the safest cities in the world. But you still had to go through the 80s, with homelessness etc. I recall what it looked like around Madison Sq Park or Tompkins Sq Park, was a real hellhole that the city pretty much gave up on. I’m sure they would set on their hands and done nothing about it. These were politicians just eager for a vote in anyway they could get it, and the poor? The hell with the poor. Yeah, it would have probably gone downhill and become a homeless encampment, the way both Tompkins Square Park and Grand Central Station did, but so what? Those two iconic places were brought back to their peak of beauty, and I have no doubt the same would have happened to Penn Station. And better it got crappy for a while and was then revived rather than being demolished, thereby forever losing the chance to rehab it back to what it was originally. The same unconvincing argument could be made for Grand Central and countless other structures. Should we have demolished those as well? No. They were preserved, and rightly so. I do think Mick makes a good point: so many city facilities like train stations, parks, and bus stations were practically taken over by vagrants in the 1980s. Parks that are beautiful and well taken care of today were riddled with drug addicts and mentally ill New Yorkers who had no other place to go. 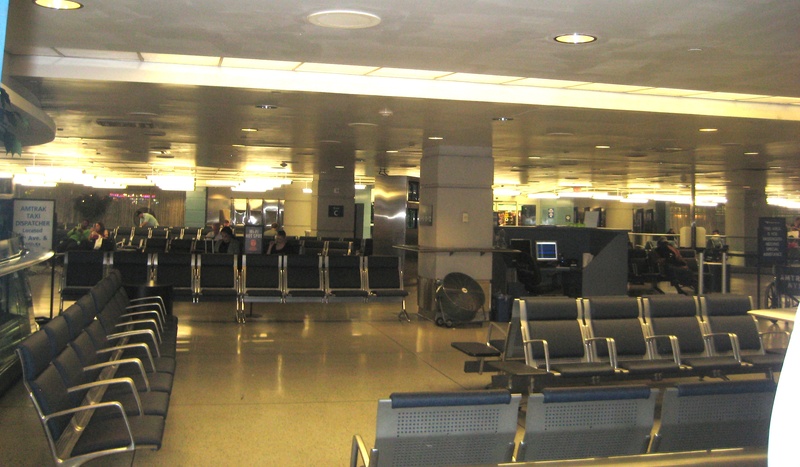 Penn Station’s gorgeous waiting room and concourse would probably have suffered the same fate. Penn Station (-and Grand Central Terminal too) are not and have never been patrolled by the Port Authority. Rather they fall under the purview of the MTA Police. The MTAPD is the direct descendant of the LIRR and Metro North Police departments, who patrolled those stations in the 1980s. They too are a fine bunch. Doug is correct. The PAPD did, and do, patrol the PA Bus Terminal, and we all know how that place used to be, inside, and out. I remember a great quote recounted somewhere (NYRB?). Having gone through the current Penn Station a number of times, I found it very apt. Bull……..Only fault lies with the politicans of NYC. Palms were greased to construct the new terminal. Enough is enough! I did say it was the Lindsay administration that allowed the destruction of Penn Station! Reagan and is ilk were responsible for cutting social welfare programs, allowing bus terminals and train stations to become defacto homeless shelters! Obviously the destruction of Penn Station was a tragedy. But get your facts straight. The mayor at the time was Robert Wagner Jr., not Lindsey. And the building was owned by the near (and soon-to-be) bankrupt Pennsylvania RailRoad. They simply could not afford to keep that building. That said, it is a tragedy that it was demolished. 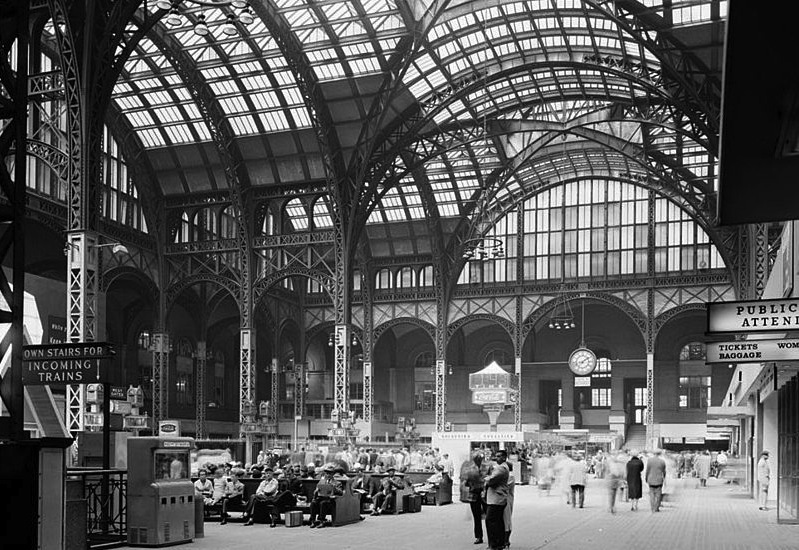 Demo of Penn Station was a crime against humanity. how ever long ago it was written, it certainly is appropriate…sad that such a structure was demolished…yet we still do it today…not on the same level as this but look… Yankee stadium….a true piece of New York history….gone…yes it’s “just a stadium” but still…part of the history we always seem to eradicate in the name of progress…..
You are absolutely right! I totally forgot about the “House that Ruth Built” Obviously, it was done for the greed of money. Perhaps it wasn’t as ornate as Ole Penn Station, but still had memories that will never be the same. Thanks Chaz. Yankee Stadium had already been gutted by the “renovation” of ’76. I loved tha place, but the new park is a vast improvement. The difference is that NOONE is going to build a breathtaking transit terminal EVER. If the Farley post office didn’t exist we’d never get a second chance at this. crikey i loathe it. the only place (apart from a funeral parlor) i’ve seen actual dead people. cops standing around joking about it. loud drunken middle management types passing by. rangers fans. is this where i’m going after i die? New York at one time was a city of enclaves, each one distinct and separate from the other, and you did not go to another district without standing clearly out. There was Chinatown, Little Italy, the Lower East Side, Hell’s Kitchen, etc. In the way there was also a clear evident NYC accent which was clear in where you lived, a Brooklyn accent could not be misunderstood for a Manhattan one much less a Bronx one at that. Each neighborhood thrived on it’s separation from the other neighborhoods even so they were very close to each other. When the destruction of Penn Station was announced who in the neighborhoods gave two cents about it? Everyone was interested in their own survival which meant putting food into their mouths. All I’ll add is that these photos demonstrate that there are obvious, objective standards for artistic beauty. Not everything is in the eye of the beholder. On Friday’s I post something I came across during the week that I loved. I’m obsessed with Ephemeral NY! An architectural side-note: those are Corinthian columns, not Doric. Abe, There were Corinthian columns and Ionic columns in the Waiting hall and Doric on the outside. To the people saying the building was condemned, It was NOT. It was sold becuase the railroad company couldn’t afford its up keep.. It was dingy at the time of destruction. But that’s no reason to demo. I can remember Grand Central Station being hideously dingy and dirty. But it got cleaned up and it is a landmark. I’m sickened by the loss of Penn Sation. The misnamed “Waiting Hall” alone had blown away Grand Central Sations. Now they are gonna use the post office and add HIDEOUS modern glass to the back. With that money, they should recreate the main waiting hall. NYC really screwed the pooch when it tore down Penn Station. Fact is that there has been nothing – NOTHING – built in the state that comes close since then. And there probably never will be, since people don’t even know how to do this kind of construction anymore. It’s great that it led to the preservation movement, but it will always be a tragedy nonetheless.